Political prisoners with birthdays in September. download the poster and print it out and mail these fine folks a birthday card! Poster is courtesy of the Chapel Hill Prison Books collective. 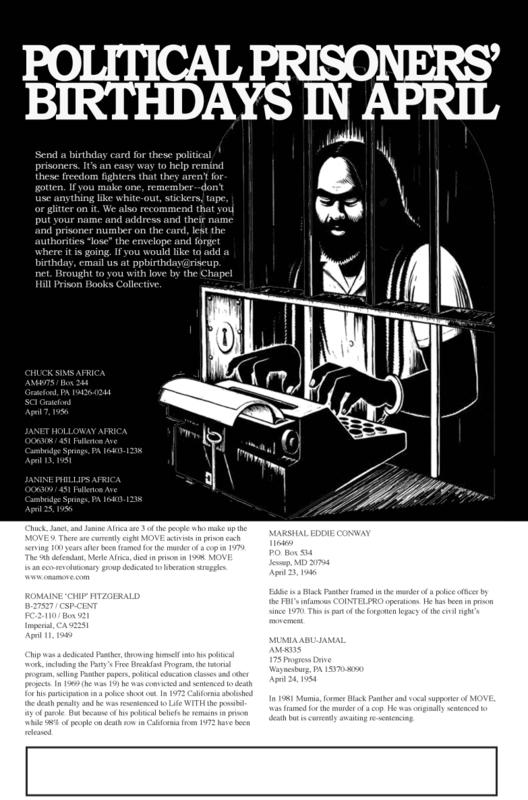 From the Chapel Hill Prison Books Collective, a poster of US political prisoner birthdays in august (11×17 pdf). I’ll hopefully be posting every month’s poster here from now on… I missed this summer’s cause I didn’t have such good computer access. Send a birthday card to these political prisoners. It’s an easy way to help remind these freedom fighters that they aren’t forgotten. (click on image for poster-size pdf).